10 years antropologi.info and what about the future? Although it was ten years ago I started this blog and anthropology portal, I am not sure if there is something to celebrate. The website has been more or less dormant for nearly two years now. Despite several attempts to start up blogging again, I failed to keep it going. But now, because of the anniversary, what about starting another attempt? Life is more or less upside down after I went to Cairo, Egypt, three years ago and got stuck here. It was supposed to be a short trip, but I ended up getting married here. That was the most wonderful thing that ever happened to me. But I still have to find out how to combine my new life as husband with my previous favorite activities like blogging. That’s not the only thing. I will have to think about how to continue. The blogging world has changed tremendously. Ten years ago there were hardly any blogs, now there are endlessly many, and it’s no longer possible to follow all of them. While until a few years ago antropologi.info has been regarded one of the most important anthropology blogs, the situation is different now. 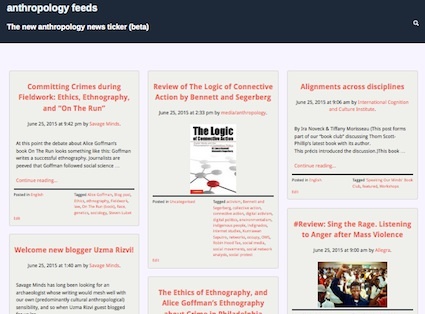 Not only because there are lots of great new blogs like Allegra (my new favorite anthropology blog), but also because people consume news and information primarily via quick links that are posted on Facebook and Twitter. Until I would have finished writing my summaries of news stories, most readers will already have read them via links others have shared on Facebook or Twitter. Blogs are also supposed to have their own Facebook and Twitter (and maybe even Google+, Linkedin etc) pages. That’s where the readers are. Shall I give up my resistance against this trend? What kind of content shall I focus on? And shall I continue blogging in three languages? Sometimes I wonder if antropologi.info is still needed as there is no shortage of anthropology online now. But then I realise that blogging is something I am also doing for myself. I learn so much through searching for new stuff to blog about, and such intellectual stimulation is good for my mental health (an especially important point when you’re living in a dictatorship, you know!). And I enjoy being part of the anthropology community, I made many friends via blogging both online and offline. It is also encouraging that old posts still get mentioned on Facebook and Twitter (now it’s my overview about Open Access Journals on the Facebook page of Hau: Journal of Ethnographic Theory with 56 shares), and despite lack of activity I get still notifications about people who are subscribing to antropologi.info’s newsletter (currently only in Norwegian). Then I often think that anthropology still suffers from US-centrism that needs to be challenged. Not only because there are so many US-based bloggers but also because of their often rather limited perspective. When for example one of the more famous anthropology blogs wrote about the crisis in anthropology, they had the crisis in American anthropology in mind, but without mentioning it. Anthropology for them only seems to mean American anthropology. One of the aims of antropologi.info has always been to also present a more global anthropology. Not at least therefore I am happy with the Allegra blog, running from Finnland giving fresh new perspectives. They also addressed the US-centrism during their coverage of the largest gathering of anthropologists in Europe that many of their American colleagues “pay next to no attention”. Finally, I have to think about financial aspects. Getting married in Egypt always means financial disaster - for me as well of course. I am deeply indebted which makes me wonder if I actually can afford to spend time on activities like blogging. I should focus on my freelance job at the University of Oslo, instead. Antropologi.info with all of its content will of course always be open for everybody, but nevertheless I might have to think about opening up for some kind of micro payment and voluntary subscriptions. That would help me in updating and developing this website. So to get started again what about declaring that I will reserve at least half a day for antropologi.info every weekend? PS: I was just reading my historic 2009-post 5 years antropologi.info and was surprised about reading that in 2004, spam did not exist! As some of you might have noticed, I've taken down the old bulletin board as it had become too popular among both human and non-human spam bots. So send me your announcements, and I will (most probably) post them. Now I am a truly engaged anthropologist! I wanted to write this post long time ago. As you might have noticed, there haven’t been any new posts on this blog since the 24th of October last year. Well, at about the same time I wrote my last blog post, the most wonderful woman entered my life. Two months later we already got engaged. And in a few months, I hope, we will get married. So yes, now I am a truly engaged anthropologist! ! Getting married in Egypt is for me a wonderful, but not actually a cheap endeavour. My economic situation forces me therefore to focus on my paid job at the University in Oslo. Nevertheless, I hope there will be some time for blogging and developing the website soon. I really miss it and I’d like to start up again! In the meantime you can have a look at the website of the new research project by anthropologist Thomas Hylland Eriksen that I am currently working for. It’s called Overheating. The three crises of globalisation. I’m about to upgrade the blog engine (antropologi.info is powered by b2evolution) and I hope everything will work fine, but you never know, upgrading can get tricky. In any case, the blog will be unavailable for at least for a few minutes during the upgrade process. I hope I’ll resume blogging shortly afterwards, it has been quiet here too long already!! PS 18:06 - Upgraded! And everything seems to work as it should, yeah!